Boot Bananas is a shoe absorbing and deodorizer made out of natural ingredients. It keeps the footwear fresh and dry thanks to it's absorbent minerals and fragant essential oils with anti-bacterial properties. The "banana skin" is made out of cotton allowing the minerals to absorb the moisture while making it inhospitable for bacteria and odours. 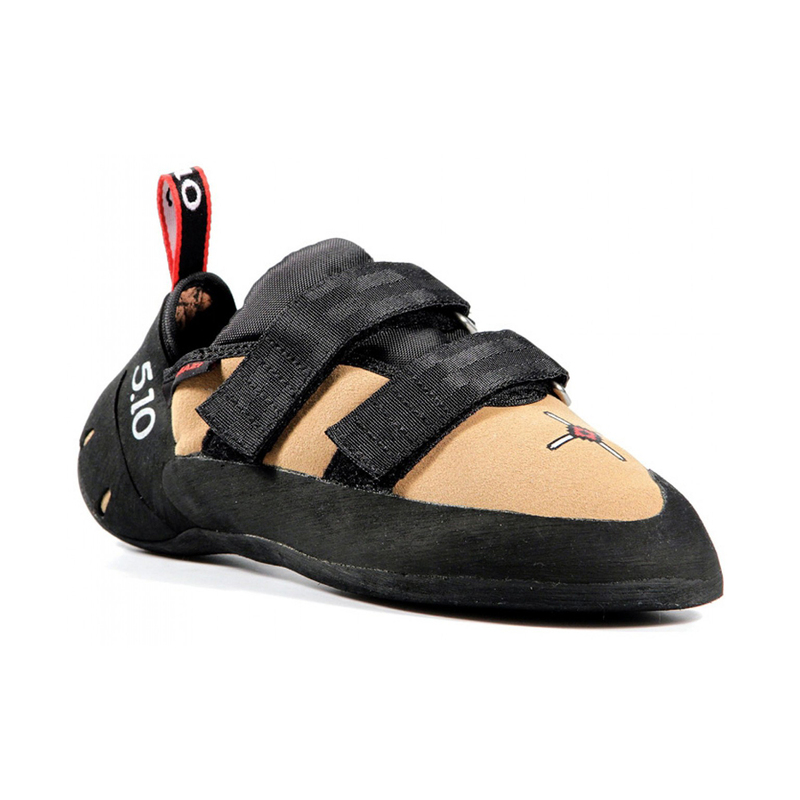 The Five Ten Anasazi VCS is an all-round climbing shoe designed to be a little different: the Anasazi VCS features a flat profile, making it one of the most comfortable "all-round" shoes on the market. Not only that, it's incredibly sensitive. On edges and smears on long multipitch routes, or on granite crack climbs and trad routes with low friction, the Anasazi VCS will undoubtedly reassure you that comfort is sometimes the key to success - it's not all about masochism all the time! It's also a non-aggressive gateway for the beginner seeking a high-performance all-round shoe that can be taken sport climbing or bouldering, indoor or out. The Anasazi VCS features a lined synthetic upper, which means there will be the absolute minimum amount of stretch. Remember to size appropriately. If you're looking for a low-volume version, try the Anasazi LV Women's. Idéal pour les grandes voies dures, chausson sans cambrure avec une faible asymétrie tout en restant précis en pointe. Parfait pour les longues journées sur la paroie ! En ce qui concerne la taille je conseil de choisir le confort au premier chaussage, le talon doit être bien à ça place mais les orteils pas trop écrasé. All day comfort with pretty good all around performance, maybe not your first pick for a roof but certainly does the trick whatever you’re getting yourself into. Lined synthetic gives you the right fit out of the box that breaks in without really stretching. It seems that now also the brown Anasazi VCS (golden tan) comes with Stealth C4 per default instead of the harder and more durable Stealth OnyXX rubber (which is also better for edging). Other shops list the brown Anasazi VCS (no "V2" in the name any more) with C4 sole, some list it as 2018 version. Here in the epicTV shop they forgot to change the description, because i ordered a golden tan Anasazi VCS to get one with the Stealth OnyXX rubber and got the shoes with C4! I had to pay for the return myself. So just be warned if you want the OnyXX one. The violet one doesn't seem to be manifactured any more (there is no point if the brown one has C4, why a violet one also with C4?). Lets see when the Anasazi Pro gets available (same as Aansazi VCS V2, but with pre installed toe hook patch of Mi6 rubber 8the one from the Team VXi), the breathable tongue from the Quantum + a little bit more heel tension. Comes in brown and the LV version in Red - both with C4 rubber. So WHY gets the "old" Anasazi VCS also JUST C4 rubber any more? Where is the OnyXX rubber for edging and for more support for the feet on longer roots, f.e. alpine stuff? I'm climbing in these shoes for 10 years. Every time I bought another type/brand I've been disappointed. Will not buy anything else. I've been using this shoe for a couple of months now, and I'm quite satisfied. I mainly use them for outdoor sport climbing. They have a very good grip, and are overall quite comfortable out of the box. (i wear the same size as my street shoe) They have a tight fit, and they don't really stretch. I've tried to climb multiple pitches in them, but the pain was unbearable after 3-4 long pitches. I wouldn't recommend them for multipitch use. As a conclusion i would say that they're worth the money. Great quality and great performance all-around, but not a wear-all-day kind of shoe. I actually bought this pair to get me through the days while my La Sportiva Miura are resoling. I had previously borrowed this model from a friend of mine and so I knew the size and I knew what I was getting into. The sole is top notch, sticky and rigid enough to give you support in vertical routes. The shoes are incredibly comfortable and I barely know I have them on -- which is a good thing in long routes or when you're on-sighting and need to stop and think. I bought them in my normal street shoe size but in hind-sight I could have gone a half-size lower. However, since they don't tend to stretch I opted not to risk it: I'm not one of those "as-tight-as-humanly-possible" kind of climbers, so I try to live in that performance/comfort knife-edge. Once my Miura come back, I'll be using them mostly for redpoints and keep these ones as my workhorse shoes. The only complaints I have -- hence the 4 stars -- is that the shoe could be a bit more pointy to help in small pocket and the heel is a case of hit-or-completely-miss. Since I'm not one of the lucky ones to have that particular shape of heel, I feel some dead-space in that area, which can be a bit uncomfortable when your pumped and feel the back of your foot wiggling inside the shoe. But, all in all, a very nice piece of kit that I'm hoping will give me great joys in the months to come. Till now my best climbing shoes ever! I'm not a professional climber (so don't judge), but the feeling I have on the rocks and indoor in these shoes is awsome. Just fits like a good pair of jeans. It does what is needs to.... comfort and durability. My size in "normal shoes" is UK 7.5 --> Anasazi bought is 6.5 --> after 5 sessions climbing fits perfect ! So this is more a shout-out to those less who are less experienced in the ways of climbing shoes (like myself). I did my research online, and I found that generally it is recommended to go a few sizes down from your normal shoe size. I'm normally a size 5, but I have pretty broad feet and so I decided to be cheeky and try these shoes on at my local indoor climbing centre (knowing full well I was going to order them online and get them cheaper). I am so glad that I did! As an alternative of these shoes exists for those with narrower feet, I was feeling confident that these would feet my own broader feet. However, I found them extremely tight in my normal shoe size, let alone a few sizes smaller. I've been climbing in them a few times now and the pain is starting to subside - I think they will be comfy one day and the grip is fab! But there is no way that I should have gone 2 sizes down. You can be one size one climbing shoe and a totally different size in another - so don't automatically go several sizes down when ordering online!!!! After couple of years i start climbing again and in the past 12 months i purchase 3 pair of climbing shoes: one for indoor other for multipitch and last for hard single pitch. Always the same issue, take smaller and suffering or right size and not useful?! My friend lend me his anasazi and i did 250 mt routes without get out the shoes at each pitch and then i purchase and i did 14 pitches route and i have been very confortable no pain and very nice in all terrain. I purchase the same size and usually i wear 2.5 sizes less. I do both bouldering and sport climbing so I need technical shoes that is comfortable and could be easily changed. I bought my 1st pair about 6 years ago and I still cannot give up from this model. I just bought my 4th pair and up until now, I couldn't find something to complain about. The shoes are great and extremely sticky on tiny edges. They are also durable and will help you to send many hard routes. I suggest to buy the same size or half size smaller than your actual foot-size.